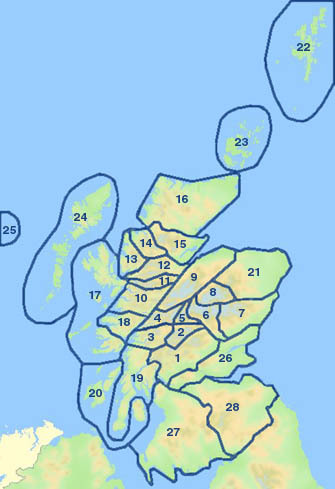 The Scottish 500-609m tops (elsewhere in Britain known as Deweys) have been split into two lists, one covering the Scottish Highlands and the other the Scottish Lowlands. A Highland Five is a hill in the Scottish Highlands between 500m and 609m high with a drop of at least 30m on all sides. (Highland Fives appear as Class=HF on this website). A Donald Dewey is a hill in the Scottish Lowlands between 500m and 609m high with a drop of at least 30m on all sides. (Donald Deweys appear as Class=DDew on this website). The hills between 490 and 499m with 30m drop are also included on this site, but these have not been sub-divided. They appear as class=4. The hills between 490 and 499m with 20-29m drop are also included as class=s4. The first publication to list the 500m tops of England and Wales was Michael Dewey's Mountain Tables in 1995. They effectively extended the Hewitts down to 500m. The Deweys were extended to Ireland (the Myrddyn Deweys) by Michael Dewey and Myrddyn Phillips in 2000, and to the Scottish Lowlands (Donald Deweys) by David Purchase in 2001. Hitherto, 500m hills in the Scottish Highlands have not had a separate identity, but a complete listing of Scottish 500m hills was compiled by Rob Woodall using data from Tony Payne, Clem Clements, John Kirk and others and uploaded to the rhb group (2003, revised 2006). To distinguish the Highland hills from the Donald Deweys in searches etc. the editorial team of DoBIH have named them Highland Fives. All the 500m lists have been comprehensively revised since their original publication by the authors, the editorial team of DoBIH, or both.